Gaetz, Stephen. (2014). 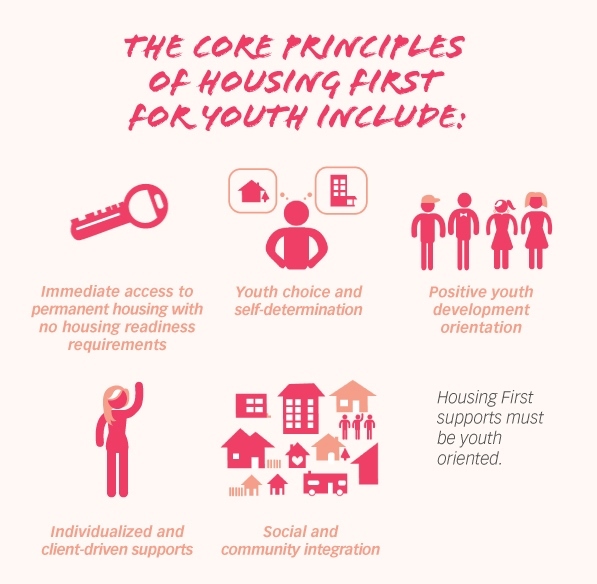 A Safe and Decent Place to Live: Towards a Housing First Framework for Youth. Toronto: The Homeless Hub Press. If your organization has or is planning on implementing a Housing First program here are some important things to consider. How do these five principles apply to working with LGBTQ2S youth? Sounds easy enough. But what does this really mean in practice? Inclusive Housing Models are housing programs with a diversity and inclusivity framework. These programs work with youth where they are at, not where staff want youth to be. They are client-centric. For LGBTQ2S youth, these programs need to have policy and procedures in place to ensure that queer youth feel comfortable, supported and respected. Staff have a level of cultural competency to support LGBTQ2S youth. Further non-LGBTQ2S are supportive of LGBTQ2S youth. This can be accomplished by the enforcement of the policy and procedures, staff being role models of behaviour and all youth participating in workshops on anti-oppression topics. Appropriate and Inclusive Referrals are referrals that consider the youth being referred. For example if you are referring a trans youth to a health care provider you want to make sure that the staff are trans positive. One of the many reasons why is this is the right thing to do, is that referrals to programs in which youth may encounter homophobia and transphobia will harm your relationship with youth. Youth should be able to trust us to connect them with programs and services that met their needs and they feel comfortable, supported and respected at. Think about times when you have received bad referrals. This could be your “friend” who sets you up on the worst blind date in the history of blind dates. Or the movie review that made you see a movie that you are still mad at wasting 2 hours of your life. These are trivial compared to homophobia and transphobia. But on some level you are probably mad/annoyed at your friend. Now imagine how it would feel to be referred to a program where you experience homophobia and/or transphobia. Appropriate and inclusive referrals are critical to supporting LGBTQ2S youth. There may be some communities that encounter challenges to finding appropriate and inclusive referrals. Please see the Partnerships module for strategies on how to support your local partners become more LGBTQ2S inclusive. Also like you would with all youth you work with LGBTQ2S decide if they want the referral. Staff training to support youth as they navigate their identities is critical. No one wakes up in the morning and says “Today I am going to be queer.” Coming out is a process. It can be an easy process for some and incredibly challenging for other (please the Suicide module for more details). For many people, the journey to their identity occurs on a long and windy path and their identity depends on the context of their location (mental, emotional and physical). Some youth may come out to you, but not your peers, or they may come out in your organization, but not in other organizations (please see How Not to Out Youth module for more details on respecting youth’s identity). Staff need to understand and be comfortable with the fact that there will be youth whose gender identities may change, for example, a young person may present as male one week, and as female the next. Inclusive Supports are vital, as a Housing First framework for youth requires Individualized and client-driven supports. Supports being offered to youth need to taken into account the individual and be what they need as part of their case management. Partnerships with local LGBTQ2S organizations has been discussed in the Organizational Survey Report and the Staff Survey Report. If possible it is important for us to connect to LGBTQ2S organizations. This helps youth develop their community connects and is a critical component of their social inclusion and their transition out of homelessness.